Old approach through Honeycutt Farm is CLOSED. The farmer is no longer interested in letting folks drive or walk across his land. The only acceptable approach at this time is from Raven Road or boating across. Standalone sandstone towers. Deep water soloing. Year round climbing. Free Camping. Fixed steel lower-offs. And tons of easy to moderate sport climbs! Believe it! Beginner and moderate Missouri climbers rejoice to finally have their own crag stacked with quality 5.6-5.9 climbing. Nearly all of the anchors are fixed with steel lower-offs which can be easily accessed for top-roping. More difficult routes can also be found here ranging from 5.10-5.11 leaving plenty of options for most climbers. The area is made up of 3 separate formations along the Pomme De Terre arm of Truman Lake. Goose Island(south rock) and The Lighthouse(middle rock) are home to the moderate climbs. While The Fortress(north rock) houses some more challenging routes. What about rock quality? Is the sandstone like Arkansas? The sandstone here is very special for Missouri but also very soft. It forms very similar to what you might find at the North Forty but is not of the same quality rock. After a rain, give it a few days to dry before climbing again. Year round? Like I won't melt to death in the summer? The north sides of both Goose Island and The Lighthouse provide shade nearly all day long. If you're still feeling warm then do a few laps on the water traverses until you fall in the lake! 38.095508, -93.339817 Primitive camping can be found at Raven Winds. Look for the wooden sign on the south side of Raven Road a mile east of the intersection of Crabtree Ave. No utilities. Do not leave anything behind here and do not give them any reason to frown on climber camping. Keep the party docile. Per the owners of Raven Winds Campground: "we do not charge a fee to stay because we are in the process of rebuilding it and starting a business but we do ask that out of courtesy to our family and to our neighbors that you would call and make a reservation. We have a sign posted at the campground that says this but here is the number you can contact to make the reservation: 8163737132. Also, we do have neighbors who are very particular about trespassers so we do ask that you avoid private property and stick to the campground and public land for your adventures unless you have asked permission from the landowners of course." Ok awesome is there somewhere I can stock up on supplies? Sure ain't! Make sure you come in with everything you'll need for a day or weekend of climbing/camping. If you forget something, the nearest gas station or general store is 30 minutes back north on US-65. From Warsaw take US-65 South for 14 miles. Head West on Raven Rd (dirt). Continue on Raven Rd for less than 5 miles until it stops at the lake. Park off the road. If it is dry, hike the shore line north. If it is wet, hike high in the tree line following the shore north. If you got a canoe, boat north from here or from across the narrow lake arm. Plans for a nice easy trail are currently being worked out. Until then, the shore is easiest way when possible. The surreal view from Raven Rocks. Was climbing there this weekend. Great routes, but watch for copper head snakes! while ascending the south face of the south rock I came across this little guy in a hold. 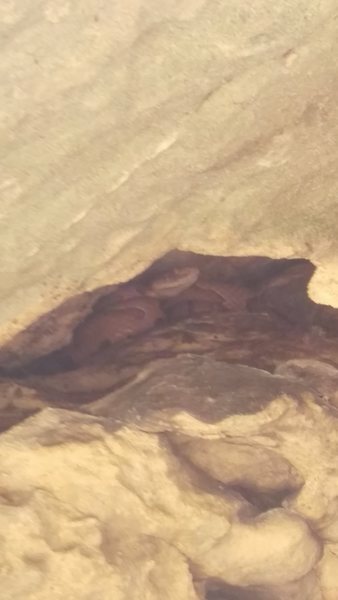 Copper head in the rocks! Getting to the rocks by the lake edge is not especially easy and requires about an hour over pretty rough outcroppings and a tree jam. Going through the woods didn't seem much better (and resulted in chiggers or maybe a rash caused by something not native to my hometown). The camping site mentioned here, Raven Winds, is private and I was told by the son of the owner that they nominally charge a fee to camp. There is a phone number on the sign at the entrance. Just wanted to let everyone know that they can not cross Honeycutt property.